Screen printing is a traditional form of t-shirt printing whereby ink is pulled through a screen onto the fabric below. It is a long-lasting form of print and is used for bulk orders of garments with the same print. A minimum of 10 units applies and the pricing decreases with the more shirts that are printed. Screen printing prices are calculated based on the number of colours in the print, the colour of the fabric and the quantity. When placing an an order for screen print, bear in mind that all shirts will have the same print/design. 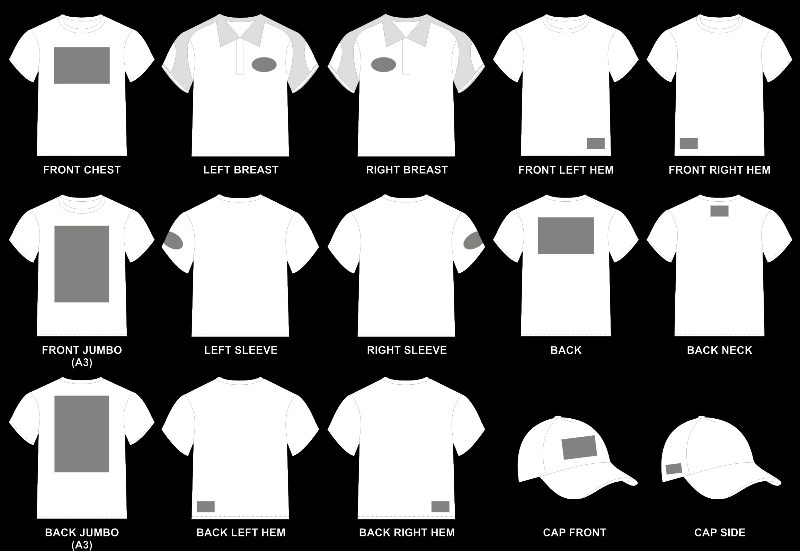 Artwork designs are fitted to fit the smallest shirt in the order. If different print sizes are required, additional screen charges will apply. Individual names or prints are not suitable for screen printing and would need to be heat transfered. The best way of printing multiple cotton shirts with a design is screen printing. A screen is created by coating it with a light sensitive emulsion on the mesh surface and when dry a stencil of the design (positive) is then exposed onto the screen using a light table. The light solidifies the emulsion around the design and where the light fails to pass through the design, the emulsion does not expose and the design can then be rinsed out of the screen. Once the screen is dry, the machine is set and the garment is placed onto a board below the screen. When ready to print the screen is then brought down and placed on top of the shirt and a squeegee is used to pull ink through the screen. Some garments, such as coloured shirts, require 3-4 layers of each ink colour to be built up between flash drying to ensure an opaque print. Once the printing is complete, the garment is removed and cured through a curing tunnel to dry and cure the ink into the fabric, ensuring a long lasting print. Each colour in the design requires its own screen and setup, so multiple colour designs become expensive to print if only a few garments are required. Very fine detail and text less than 3mm high should be avoided as it can often 'close up' during printing due to the ink bleeding. The texture of the fabric being printed onto can also impact on the print finish and superior detail can only be produced on a smooth fabric. Screen printed garments wash well, have a softer print and should not be confused with heat transfers where the print sits on top of the garment and does not last as long. Many print shops soley use the heat transfers for printing t-shirts which results in people having little confidence in screen printed shirts as the two are often confused. We print with a range of standard waterbased fabric inks for use onto cotton, poly-cotton and polyester blended garments. Our standard range of inks are waterbasd and safer to the environment than traditional plasticised t-shirt inks. We offer our standard inks in the colours below including dayglo (neon) and metallic colours. On special request we can mix specific Pantone colours or print using a puff ink (raised feel), discharge (old distressed look - soft feel as print bleaches into fabric) or pearl base (shimmer). Screen Printing is very time consuming. Our standard lead time is approx. 5-7 working days on quantities less than 50 and 7-10 working day on quantities above 50 - dependent on the current production schedule at time of your order. The above times are based from the day after you approve your artwork. Always allow additional time for artwork, proofing and any unforseen circumstances (such as power cuts). If you need sooner let us know when you place your order and we’ll do our best to accomodate. When you order screen printed clothing there are two factors that affect the price. Firstly, the number of colours in the design. The screen and setup cost is included in our print price but bear in mind that designs will multiple colours will make the price more expensive. Secondly, the number of garments being printed with the design. The price is based on all the garrments having the same print put onto them and the unit price becomes cheaper when you print more. Our reputation speaks for itself. We have been around for over 25 years servicing the printing industry, and you don’t get to be that old if you don’t know what you are doing! We have a hands on approach to every job that we do and we let quality and detail be the main factor behind each of our jobs. We don't settle for second best! How do I get a price for my print job? Email us the design you wish to print, along with the quantity of garments required and the type of garment and we will be happy to send you a quotation. We are able to source and supply selected garments on your behalf from the leading South African manufacturers or you are welcome to supply your own garments and we will just do the printing. Do I own the positives and screens once you have finished printing? No. We have included a screen and setup time in our print price which covers the labour involved in creating the positives and the screens as well as seting the machine up for print. This does not include the purchasing the screens or the positives. After the print job is finished we reclaim and clean off all our screens and re-use them for future jobs. Do your prices include the supply of the garments? No, prices do not include any garments unless stated that the garment is included. We can source garments on your behalf from the manufacturers, however if a particular garment or size critical job is required we recommend that our customers get their own garments to provide to us so that they are totally happy with their choice before any printing. I have an idea for printing, but I don’t know how to create it. What can I do? We can provide artwork designing and redrawing services. This incurs an additional charge depending on the complexity of the job. For any design services, please contact us and we will advise you on specific charges. I have something that is urgent and needed to be printed yesterday! Can you help?? Send us the details of the print job and we will try our best to accomodate. At times we can take on rush-orders, however these types of jobs will incur additional fees, which you will be informed of when you place your order. How durable are screen prints? Screen Printing is very durable and long lasting. Using water based inks we print directly onto the garment using pressure and multiple layers of ink. Once the print is complete the garment passes through a t-shirt oven to cure the print at a high temperature for a certain amount of time. This ensures the print says on the shirts and does not wash off.